MIDFIELD CLASS: Idrissa Gueye celebrates scoring his first goal for Everton. The last time David Moyes returned to Goodison Park as a manager was in 2014 when the Scot, who was at the time Manchester United boss, found himself overshadowed by an onlooking grim reaper from the stands. On the same afternoon Moyes then went on to endure a defeat at the hands of his former side – his last as United Manager as he was sacked the very next day. The result in that infamous fixture back in April 2014 was 2-0 to the home side, and that was again the scoreline when Moyes returned to Merseyside to take on Everton once more, this time whilst in charge of a struggling Sunderland outfit on Saturday afternoon. Moyes was just one of the familiar faces returning to Goodison on Saturday, and it was fitting that Everton ran their ‘Retro Day’ theme for the match as half of the current Sunderland squad is made up of former Toffees. To be honest I expected the visitors to turn up in our away kit, with Chris Woods doing the goalie drills and Steve Round Dishing out the Lucozade. Ok that’s probably an exaggeration, but the likes of Lescott, Pienaar and Anichebe are plying their trade at the Stadium of Light these days (or in Lescott’s case, topping up his array of fancy cars), and it was the two most recent recruits from Everton that would start for Sunderland – Oviedo and Gibson – and both were given a warm welcome back. 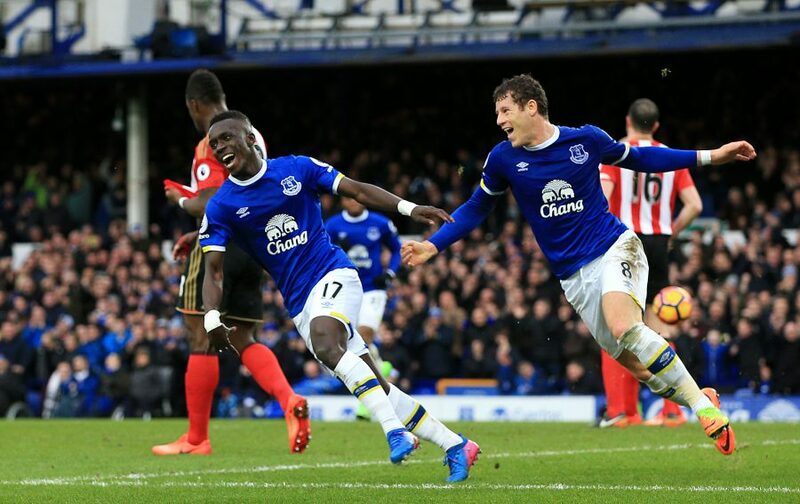 A quick word on that aforementioned duo before I get going on the game itself – firstly Bryan Oviedo: in my opinion a good lad, professional and hard working, but never really the same after that horrific injury and to be honest never really a good enough deputy to Baines, or a good enough player for what Everton need. Credit to him for moving on in search of regular football and good luck to him. Darron Gibson: very much a case of ‘what if’ with Gibson, dogged by countless injuries and never enough time fit to get a consistent run of games. Rumours about off-field problems probably never helped either. No denying he was/is a talented player however I was surprised he stayed at Everton for so long because he hardly ever played. Again good luck to him at his new Club. To the game and after what felt like 3 years waiting for Everton to play again it was back to EPL action as Koeman opted to keep with the same starting XI as he did a fortnight ago at the Riverside. Gana, Schneiderlin and Davies formed the new-look Everton midfield trio with Barkley and Lookman further forward supporting Lukaku up top. The Blues were looking to maintain their unbeaten start to 2017 and make it 9 games without loss, meanwhile Leighton Baines took to the pitch for the 300th time in royal blue and quite fittingly he was made captain for this landmark outing. That lad even makes armbands look cool. The game had a lively feel to it from the off and after 6 minutes the home side carved out their first half chance of the fixture. Baines worked a cross over from the left-hand side and it found the advancing Lookman, who got a right-footed shot away and it looked to be a comfortable save for Pickford, but worryingly for the travelling Sunderland fans the ‘keeper spilled it, nearly into his own net, but then managed to smother the ball just in time before it crossed the line. An early warning sign fired from Everton and some rustiness shown from Pickford who had been sidelined for a while through injury. Five minutes later Everton had a couple of other minor chances but failed to significantly threaten the struggling visitors. Firstly Ross Barkley hit a low corner over from the left and as Sunderland sliced the ball and failed to clear, Lukaku failed to capitalise and get a boot on the ball for what would have been a certain goal. Moments later Seamus Coleman – who had an impressive game from right back – was fouled right on the edge of the penalty area but the resulting free kick was completely wasted by Everton. Gana Gueye also came close after battling well down the left hand side and forcing another save from Pickford on the angle. Frustrating but at least we were showing signs of positive forward play. The visitors then had their own brief spell of pressure, albeit only slight pressure, I’m not being biased here, they hardly threatened all day apart from 5 minutes in the second half. Oviedo looked to hit the headlines with an effort on goal which deflected wide and from the resulting corner our defenders forgot how to stick a boot through the ball or defend so it bounced around a lot, which generally causes mass panic in defence and Bovril scalds on the Goodison terraces, before somebody actually gets it away. To which widespread screams of ‘get outtttttttttt’ from around the ground usually follow. The most Sunday League shout you’ll ever hear. Yeah, I’m sure you can relate. Fabio – the Liverpool legend who tries to eat his hand when he scores – Borini then flashed a harmless effort wide but in reality we never really thought Sunderland could hurt us, all eyes were on the other end of the pitch to see what Everton could create and just how long it would take for them to do it. From the 25th minute onwards you could sense an upping of the gears from Everton. Although this wasn’t us at anywhere near our best, nor was the 90 minutes one for Premier League Classics, we became more hungry, more dominant, and we began to feel a goal coming. I believe this was mainly down to our midfield; our use of possession and movement was a joy to watch at times, the transitional and positional play of Schneiderlin, who shielded the defence magnificently, allowed Gana and Davies to roam, it also allowed Barkley to do what Barkley does best – go forward. By shielding the defence it also takes away any uncomfortable moments of possession coming out of the back line by Williams and Funes Mori, and it also strengthens the space and flexibility of Coleman and Baines, because Davies and Gana can cover, and our two full backs both had good games against the Black Cats. Gana could find himself in more advanced positions and he, as well as Davies and Lookman, began linking up with Barkley and Lukaku as the screw begun to turn. Rom had a quiet afternoon overall but he showed his first sign of threat when he turned and went at goal from the left, something he loves to do. Unfortunately this chance was shut out but if we could get Lukaku doing this then the chances and goals would surely follow. You have to play to his strengths, get the balls into the positions or get him in the areas he can hurt teams. After the half hour mark Darron Gibson was booked for a foul on Lookman and on 37 minutes Lukaku lead an Everton counter attack which looked promising but had no end product – a good assessment of what we’d seen so far from the Blues. With half time approaching it was vital we got our noses in front to settle the nerves and stop several thousand Evertonian Dad’s having stress related incidents on the concourse and thankfully on 40 minutes, we got our wish. Young Tom Davies, who would have been one of a handful of players being watched by the visiting England Manager Gareth Southgate, received the ball deep inside his own half on the left, looked up, brushed the ket wig aside, and sprayed a sublime cross-field ball to Coleman (let’s pretend this wasn’t aimed for Ross Barkley, please). The ball was fantastic, it swerved and formed the basis for the attack, and it also left Oviedo’s positioning as questionable as his decision to dye his hair blonde just before he left Everton. Coleman then took a touch and provided a perfectly timed and weighted assist to Gana who fired in from the edge of the box to mark his first goal for Everton FC. Proof that Schneiderlin’s inclusion is working already as Gana can advance more, and the perfect way to bounce back after a bit of criticism from his manager about him being tired against ‘Boro after his involvement over in Africa. Let’s be honest though, any of us would be happy just looking like a tired Gana Gueye when we played footy, the lad is immense and I swear I’ve just seen him sprinting past ours. He’s everywhere, body on the line, fighting for the cause, and now with more offensive responsibility coming his way I was made up to see him get off the mark for Everton, he’s been brilliant since signing in the summer. Before half time, Ross Barkley started showboating on the right hand side and soon after, sent Gibson’s head west with a few Phil Neville step-overs before hitting a dipping effort from distance which forced a save from Pickford. Although those last two sentences don’t mean much in the context of the game and result, for me they are huge in terms of what we’ve seen from Ross Barkley this past 8 weeks. The lad has come out of his shell, almost like he’s been given a new lease of life and he is oozing confidence and enjoying his football. I’m happy for him, and I hope this type of form continues. Fellow Evertonian and Scouser Tom Davies himself had an effort on goal before the interval but unfortunately his shot bounced back off the post and denied the youngster what would have been a memorable, half-volleyed strike with the outside of his right boot. We went into the break 1-0 up, it could have been more but we were improving as the game had gone on, you got the feeling a second after the break would kill the game off. There were no changes at half time and just like any other Premier League clash, it is never plain sailing and Sunderland came out from the restart looking to get at Everton immediately. We looked like we had lost our way slightly and the half time whistle had disrupted our flow, as Sunderland went forward with Defoe looking to find a leveller. Oviedo fired over a couple of dangerous looking balls before firing an effort on goal wide, Sunderland claimed for two hand balls inside the box on Ashley Williams (waved away, thankfully) and then Billy Jones (least likely name for a footballer) skimmed a header across goal which avoided everyone. It was a mini period that Sunderland would have taken heart from as the game became more and more stretched. If Sunderland were to get back into it then they would have to commit more men forward and the game would change, but Everton still offered a huge threat going forward especially with our midfielders interchanging and dominating the central areas of play. Tom Davies chested a long ball down brilliantly to Coleman who played the one-two but couldn’t control Davies’ return to him in the box, and this was probably our first positive passage of play of the second half. We needed more of it if we were to get a second crucial goal. On the hour mark, Koeman brought on Mirallas for Lookman who had a disappointing afternoon overall. 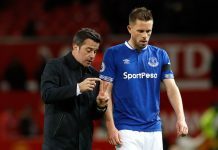 The youngster is still finding his feet in the Premier League and it is still very early days and he made way for Mirallas who had missed the ‘Boro draw with a groin problem. Ten minutes after coming off the bench Mirallas had a great chance to seal the win when Barkley broke forward for Everton. Barkley delayed his through ball – which was met by moans and groans from certain fans, sums up some of the drivel they come out with at times, instead of watching the game or understanding football – but Barkley’s ball was measured, well timed, weighted and he laid it on on a plate for Mirallas who could only drag his shot wide of the mark. Frustrating. Koeman then immediately introduced Enner Valencia for the impressive Tom Davies as Everton searched for a second. After some great build up play down the middle, Mirallas worked the ball to Coleman who cut the ball back across the box invitingly but Barkley sliced his effort wayward and couldn’t capitalise on what was a huge chance from close range. Would these missed chances come back to haunt us? It has certainly happened before. With fifteen minutes left Lukaku was the latest to go close when he out-foxed Lamine Kone, went through on goal but was denied by Pickford. 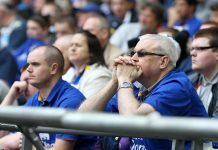 The score remained at 1-0 and we began to get restless as the visitors stood firm. Oviedo was booked on the Everton right for a tackle on Gana but again Everton failed to make the following chances or spells of possession count. The game opened up and when Morgan Schneiderlin lost possession in a challenge which looked a certain foul, Sunderland found an unlikely breakaway, worked the ball to Jermain Defoe who entered the box, shimmied and looked certain to score, but thankfully for Everton the ball hit the bar and bounced out and was eventually defended away for a corner. A real collective sigh of relief swept Goodison Park. The game could have turned out so differently had that gone in and all of our hard work could have been undone. When you get a bit of luck like that it is important you take it and thankfully within moments of Defoe hitting the woodwork Everton put Sunderland to the sword and finally sealed the victory with a second goal. From going so close to conceding an equaliser to going two-up within sixty seconds, but it’s the least we deserved. The ball broke down the right hand side following some outstanding work by Gana who contributed massively to that goal, Mirallas ended up with the ball, released Lukaku from the Everton half, Lukaku then outmuscled the haplessly chasing Oviedo, bared down on goal before digging the ball past Pickford with the help of a slight deflection off the defeated Oviedo and into the net to make it 2-0 on 80 minutes. Relief. Rom at his best. 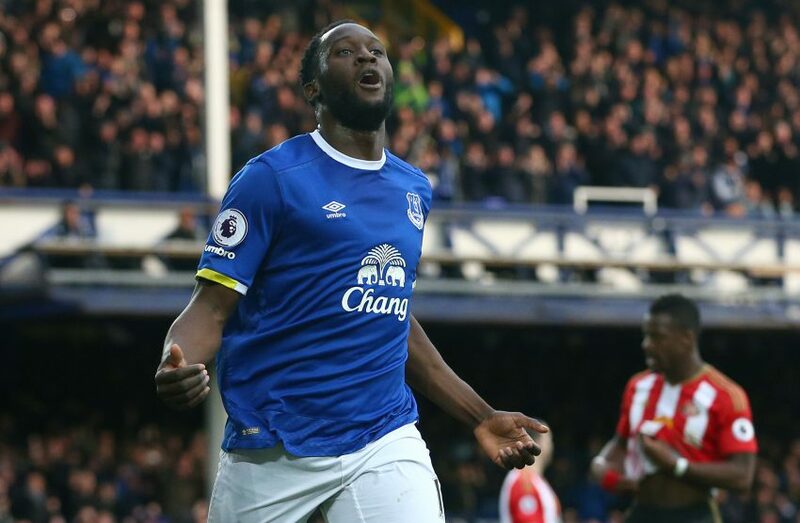 That was Lukaku’s 60th Premier League goal for Everton – equalling that of Duncan Ferguson’s record but doing it within just 129 games. A nice moment and one that saw the Belgian embrace the big Scot in the Everton dugout after sealing the win. HISTORY MAKER: Romelu Lukaku celebrates the goal which equaled Duncan Ferguson’s Premier League record for Everton. Koeman’s third and final substitution was James McCarthy who came on for Ross Barkley in the closing stages and the Toffees could have put the icing on the cake with a third goal when Enner Valencia went through on goal. It was Lukaku who released the on- loan forward, only for his effort to be blocked away by Pickford and the Sunderland defence. Although some of Pickford’s distribution was dodgy, his all round play and shot stopping was of a high standard and no wonder big sides are looking at him as a potential target. If it wasn’t for him on Saturday the 2 goals Everton scored could easily have been 4 or 5. After 4 minutes of added time the game ended without any further drama and Everton had another three points in the bag. That is 9 games unbeaten for Koeman’s side now, we’ve taken 17 points from the last possible 21 available and we have won 5 of our last 7 League fixtures. A brilliant start to the year and we’ve closed the gap on United, at least for now. When you look at the top four we are six points of Champions League qualification, and eight points off second place, this isn’t me getting carried away this is me looking up the table and thankfully this is what Koeman’s Everton has got us all doing currently. Today was a case of getting the job done and many a time gone by we would have drawn that game or shot ourselves in the foot. On another day that Defoe effort goes over the line and the outcome is different but sometimes you have to ride your luck and in no way did I think we were in danger of not getting all three points against what was in total honesty a very poor side. It’s sometimes the gritty, hard-fought wins that are more pleasing and we are getting into a habit of achieving these under Koeman. The set up of the team was pleasing against Sunderland, at the back we were defensively sound; both centre halves did well as did both Coleman and Baines who had a positive impact on the outcome. In goal Robles earned himself another clean sheet (that’s 5 in 7) and elsewhere Ross Barkley put in another good confident performance and of course Lukaku added another strike to his tally, even if it wasn’t his finest 90 minutes in royal blue – he still comes up with the goods in front of goal. Ademola Lookman had a quiet game but he will come good eventually, but I’d like to reserve my final thoughts for Davies, Gana and Schneiderlin who I thought were all excellent today. All three dug deep, employed a flexible and adaptable style of play that nullified any midfield threat from the opposition but also made our side defensively tight but fluid going forward too. It’s an incredible part of our team that has developed so quickly, and to to think the likes of McCarthy and Barry – regulars over the past 3 or 4 years, won’t be getting starts anytime soon – this shows the strength in depth we have. Gana Gueye’s exuberance and energy levels are immense, and with others now in the team he is free to bomb around more and push on further, just as he did today when he got his goal. His persistence in winning back possession for our second goal was a true reflection on one strength of his game and this is something he does on a weekly basis. An interesting stat about Gana I read after the game was that he is the first player from Premier League, Ligue 1, Serie A, La Liga or Bundesliga to win 100 tackles this season (101) – don’t forget he was in Africa for a month too, just brilliant. Davies was first class also, he’s playing like he’s been around the Prem for decades, he’s going to have a great career and we should be proud he’s already making a name for himself at our Club. Confidence is a massive element of form in football and at such a young age Tom Davies has it in abundance, he isn’t phased by anything. Last but not least is Morgan Schneiderlin who hasn’t put a foot wrong since arriving from United in January. To settle in so quickly shows how good of a player and personality he is and his influence on that side is there for all to see already. Class going forward and defensively solid as the holding midfielder, able to tackle too and demonstrate an array of passing skills, willing to take the ball in key areas and take responsibility, he possesses all the qualities of a captain in my opinion and it certainly wouldn’t surprise me if he was given that opportunity in the near future if he keeps up his good work. 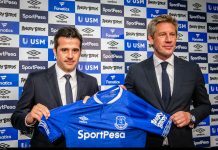 Overall it was a good win over Sunderland but it was by no means a vintage display, there are improvements to be made and Koeman made this clear in his post match comments – “Second half we played too much back. That’s about the midfielders as much as the strikers” – he isn’t satisfied and I get the feeling it is going to take a lot more time before he is, but this sort of attitude and mentality is one I am loving seeing at my Club at the moment, long may it continue. We’ve won today but let’s keep improving, if we want to compete with the best then we will have to. Let’s take each game as it comes and see how many more points we can get on the board over the course of the final 12 games.